But... WHY are you interested in digital marketing? attracts the right prospective guests? If you’re nodding YES, to any or all of those, then you’re in the right place. Before we get into the nitty gritty, this article is pretty long, so it might be easier to simply download it. Besides, it’s always nice to have it handy. At Diaz & Cooper, we’ve spent almost two decades helping to promote businesses in the travel, tourism and hospitality industry and along the way we’ve done tons of research and heavy lifting. So What Exactly Is Customer Value Journey Optimization? 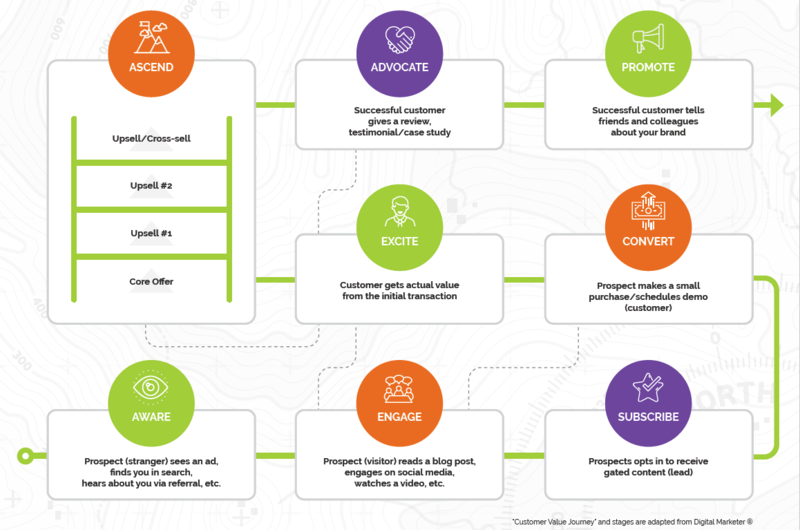 We’ve learned (and continue to learn) a lot about what works and what doesn’t, and we’ve found that the path to digital marketing success begins with a well-defined roadmap – this is the Customer Value Journey. The CVJ is a powerful take on the traditional “sales funnel” – it’s the path that your prospects take from “Stranger” to “Customer” to “Promoter” broken out into defined steps. Successful digital marketing is all about optimizing the CVJ to maximize guest experience and customer lifetime value. Customer Value Journey optimization is a powerful system first defined by Digital Marketer© and customized by our team specifically for travel and tourism businesses to maximize the potential value of prospects and customers in your sales funnel. Without a roadmap and strategy, tactics are worthless. The CVJ provides the context for the tactics and a system for success. In this article, we’re going to show you, step-by-step how to create the system. Here’s a graphic that shows the Customer Value Journey map. In this post, we’re going to show you, step-by-step how to optimize the map into an effective sales system. 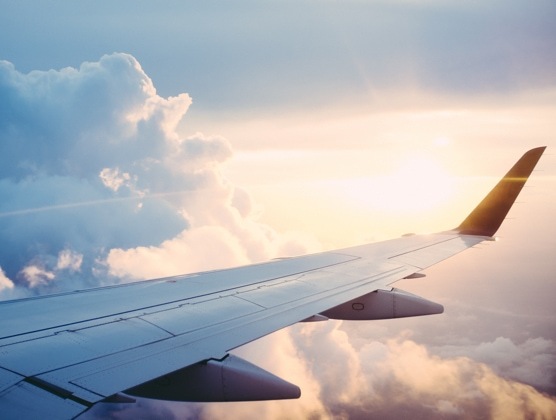 Why is digital marketing so important for the travel and hospitality industry? New bookings and repeat business drive your revenue and build your brand. Over the next 10 years, travel industry experts predict that online revenue for the travel industry (worldwide) will expand at an annual rate of 3.8% to reach $11.4 trillion. The latest Nielsen research on leisure travelers found that vacationers spent an average of 53 days visiting over 28 different websites, with more than 50% of travelers checking social media for travel advice. This means if you don’t have a plan for maximizing your digital presence, you're going to miss out on the industry’s greatest revenue growth opportunity. Imagine what it would be like if you could confidently generate booking revenue on "autopilot." Imagine getting more heads in beds (or butts on seats) and a higher profit margin even while you sleep! What would that do for your business? What would that do for your life? When done right, digital marketing can be used to make that possibility a reality. Integrating the elements of digital marketing – your website, your email communications, your social media presence – into a powerful conversion funnel enables you to automate your sale and marketing processes, resulting in inbound bookings and affording you the opportunity to concentrate on delivering unforgettable experiences that guests will want to enjoy again and again. When you can get customers more quickly and easily through a well-engineered conversion funnel, you have more power to decide how big a chunk of your revenue you want to share with OTAs and other third-parties. In this article, we will share exactly how we build fully automated booking machines using the CVJ process. After reading this article, you should be equipped to model a digital marketing plan for your business that will transform your marketing into a predictable engine for growth for your resort, airline, excursion company or attraction. Optimizing the Customer Value Journey. 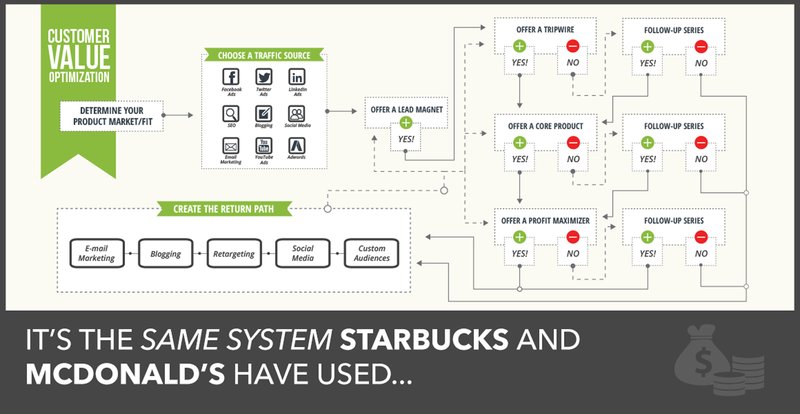 How does Customer Value Journey optimization work? The first thing you need to know is this: Your Customer Value Journey (sales funnel) is NOT about you. It’s really not even about your resort, your destinations or your tours. An optimized CVJ converts because is focused entirely on your customers – your guests. We’ll do a deep dive on the steps outlined in this image later, but for now, Here's a high-level overview of what you do at each step to attract more guests/customers, get them to spend more, and increase buying frequency. Needless to say, getting clear on your ideal customer and the desired outcome your offer delivers is fundamental to the success of your business. If you are talking to “everybody” then you are talking to “nobody.” The biggest reason marketing campaigns underperform is because they target too broad of an audience, with a generic “one size fits all” message. Buyer personas are important for guiding all aspects of your marketing plan, from website and blog content to social media and email strategies. A buyer persona is a semi-fictional representation of your ideal customer based on market research and real data about your existing customers. By defining your buyer persona at the beginning of every marketing campaign you can avoid falling into the generic marketing trap. A quick and effective way to create your buyer persona(s) is to think about the customers you currently have that are most profitable for your business, then note their general demographics, behavior patterns, motivations, and goals. The more detailed you are, the better. As an example, here is what a buyer persona might look like for a resort property. In this case Busy Brenda is a married mother of three. She and her husband are both working professionals, which has enabled them to create a pretty nice life for themselves and their children. Their combined incomes are well into the six figures. They own a nice home. Their kids are enrolled in private school. For all intents and purposes, life is good. However, due to their busy work schedules, free time is in short supply and family time tends to suffer. Planning ahead is difficult. Still, they’re desperately overdue for a family vacation that will work for a pre-teen, a 9-year-old, a 7-year-old and two very weary parents. Now that you’re laser focused on a segment of people who are most likely to buy from you, you’re ready to craft the right messaging. When someone decides to book with you, they aren’t actually buying your product or service… they’re buying the transformation your product or service makes possible: From an undesirable “BEFORE” state (like bored or stressed out) to a desirable “AFTER" state (like exhilarated or relaxed). In order to get more people to buy, you need to transition from generic, "one-size fits all" messages to articulating the move from the “before” state to the desired “After” state in a way truly resonates with your ideal buyers. Your marketing message needs to express your understanding of each of these phases as you take your buyer persona through a before and after journey. 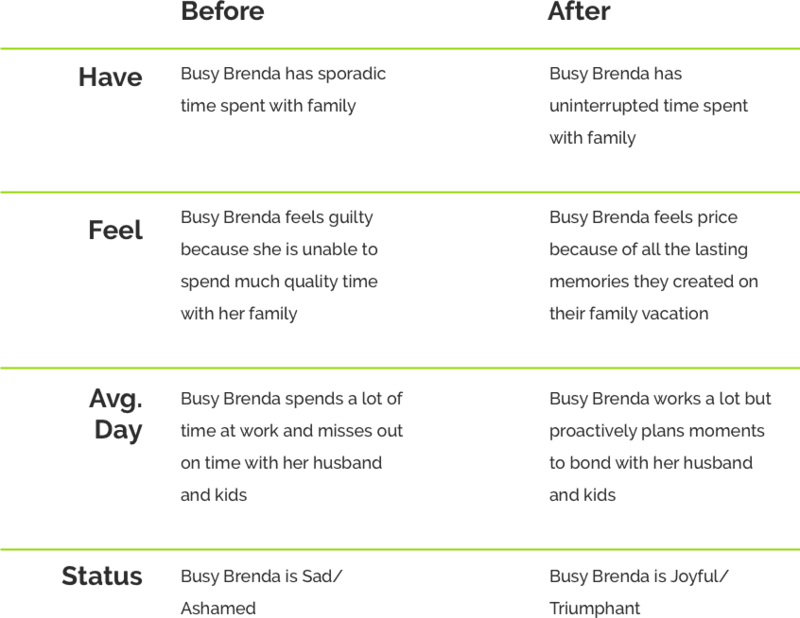 With this simple eight-question “Before/After” Grid, a decent copywriter will be able to create a marketing message uniquely tailored to connect with the desires of your buyer persona. TAKEAWAY: Average marketing messages only articulate what a customer will HAVE if they purchase their product or service. Great marketing messages speak to how a customer will FEEL, how their AVERAGE DAY will change and how their STATUS will elevate. Ultimately, the "Before" and "After" grid exercise helps you to define your Unique Value Proposition – a vital component of your marketing message – that is most impactful to your ideal buyer. NOTE: There’s a huge difference between a unique value proposition and a unique selling proposition. Unique selling proposition: “I operate a family-friendly hotel with a great beachfront location”. To attract your ideal customer into your digital marketing funnel, it’s a matter of articulating your Unique Value Proposition in a way that resonates with your Buyer Persona. Your customers’ wants and emotions versus their needs. A business traveler needs a hotel with WiFi and good work space, but they want to know they can get the job done so they can go out and hit the links or relax before that big presentation. Features and benefits of your offer. A resort may offer dining choices, pools, kids’ club, beach and other amenities. The benefit of all that is a getaway that’s sure to be convenient and fun for families. The struggle and pain your prospects experience. Prospects become customers in order to overcome challenges. For example, mom and dad need a romantic escape from busy jobs and crazy parenting schedules. The outcome and promise your product or service produces. No one buys a product—they buy an outcome. When a family books a vacation, they’re not booking a room. They’re purchasing memories, togetherness, and a great experience. Once you’ve determined all of this — and it takes a little deep thought — you’re ready to move on to Step 2 of the CVO process. Congrats! You know how to define your buyer persona and how to craft your marketing message. So, now it’s time to figure out where you will go to find your buyer persona and compel them to visit your website so they can enter your conversion funnel. Before we go any further, however, let’s make something crystal clear: This is the easiest part! Not only are platforms like Google, Facebook, LinkedIn, Twitter, Instagram and Pinterest lining up to deliver all the traffic to your website that you can imagine, but there are tons of other channels (some you may already use) you can use to drive visitors to your website. That’s a lot of traffic sources! The thing is, where you get your visitors from doesn’t really matter. You can try to drive traffic through tactics like blogging, Facebook Ads, or email marketing, but first you need to understand the system. Become the master of a single, steady traffic source. We recommend starting with one traffic source – focus on it, work it, master it, and then add additional sources to introduce more prospects into your conversion funnel. We call this the “land and expand” approach and it works. Your traffic strategy for acquiring new leads and customers begins and ends with driving visitors into the CVO funnel. The Lead Magnet is an irresistible offer that gives specific value to a prospect in exchange for their contact information. Make no mistake, although no money changes hands, this is a transaction – and, it is often the first transaction you will have with a website visitor. The Lead Magnet exists to increase contacts/subscribers (in other words, leads!) in your database because most visitors to your website aren’t yet ready to purchase on their first visit to your website. In fact, statistics show that 96% of visitors aren’t. 96% of visitors aren’t ready to purchase or request information on their first visit to your website. Because the Lead Magnet is the very top of the CVO Funnel, increasing opt-ins here will pay dividends throughout the rest of the system. But all Lead Magnets are not created equal: You will need to provide tremendous value with the Lead Magnet. That said, the common practice of asking for email with a “Subscribe to Our Newsletter” call-to-action is NOT a Lead magnet! What incentive do they have to give you their precious email – what immediate value will they receive? None. That's why most forms convert less than 2% traffic on average. This is the key to getting more leads. You DO NOT need to create something lengthy or complex. However, the more laser-focused your Lead Magnet is — the better it will convert. So, for example, this is NOT a good Lead Magnet… can you see why? Your prospect might enjoy exclusive offers, but, even more importantly they want to solve a problem. They want an outcome. This is too vague. 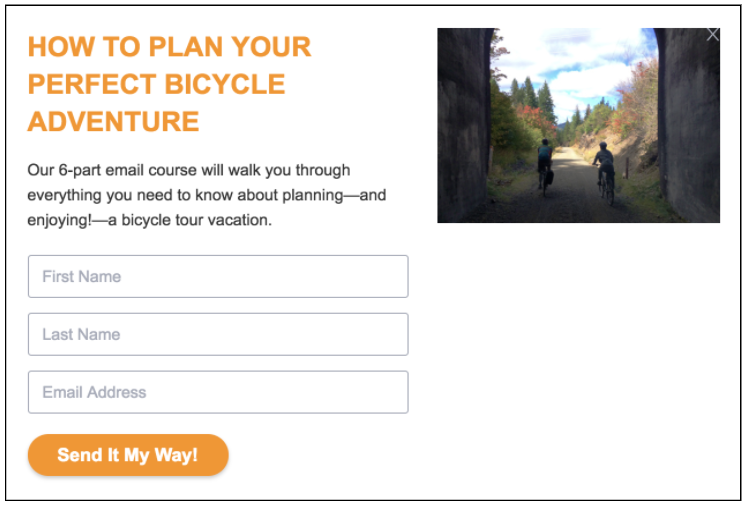 This Lead Magnet speaks directly to the company's Buyer Persona (an adventure traveler) and provides a specific solution to help them plan their next bicycle vacation. A Lead Magnet that solves a specific problem for a specific segment of the market will generate more leads. This will be pretty easy after you’ve created your buyer persona and completed the Before and After Grid, because you’ll have a clear idea of the problems they face and the solutions that can get them closer to their desired outcome. What irresistible "bribe" could you offer in exchange for a prospect’s contact information? How do you promote your Lead Magnet? The Lead Magnet is usually offered on a web page called a landing page that is optimized to convert even cold traffic into leads; but it can also be delivered through lead flows, wallpapers, embedded lead forms and other conversion rate optimization tactics. Regardless of the vehicle you use to promote your lead magnet, the presentation doesn’t need to be fancy. Using a targeted Landing Page results in a more informational lead, rather than a new random email from a person you know nothing about. When you use your Lead Magnet to entice a website visitor to give you their contact info, you see what the lead is interested in and you get a potential customer who is already predisposed to buy from you. Now, you may be thinking this is the time to hit them over the head with your offer to book your tour, hotel room, tickets, etc. And you wouldn’t be wrong... at least not completely. If you want to maximize the rate of leads you convert into customers, before you go into selling your primary product, you want to offer a Tripwire. At this point, we’ve acquired qualified leads with your Lead Magnet – woo hoo! But, they are not new guests/customers yet – boo! Even though you’re new lead has expressed their interest in buying through your Lead Magnet, a large percentage of them are likely still not ready to book a top-dollar resort, high-end experience, or attraction ticket... at least not yet. If you understand and execute on this step, you will surely convert more visitors into customers than most of your competitors. What exactly is a “Tripwire”? The Tripwire is an entry-point offer designed to convert your new qualified leads into paying guests. It turns "lookers" into "bookers." The most common way to make the Tripwire irresistible is by selling it at cost and, in some cases, at a loss to you – but, this isn’t the old auto dealership “bait and switch” loss leader concept. The Tripwire is a REAL offer, it’s just that you aren’t trying to make a living from selling Tripwires. You are selling Tripwires with the sole purpose of acquiring buyers because there is nothing more valuable than a list of buyers. who have bought from you already. When you understand the rest of the Customer Value Optimization process, you will understand how the Tripwire Offer is the single most powerful addition you can make to your conversion funnel — even though you may not make any direct profit from it. The Tripwire is not a new idea. Let’s take a walk down memory lane for a dated but incredibly powerful example of a good Tripwire. If you’re old enough to remember it, you may have even signed up for it. 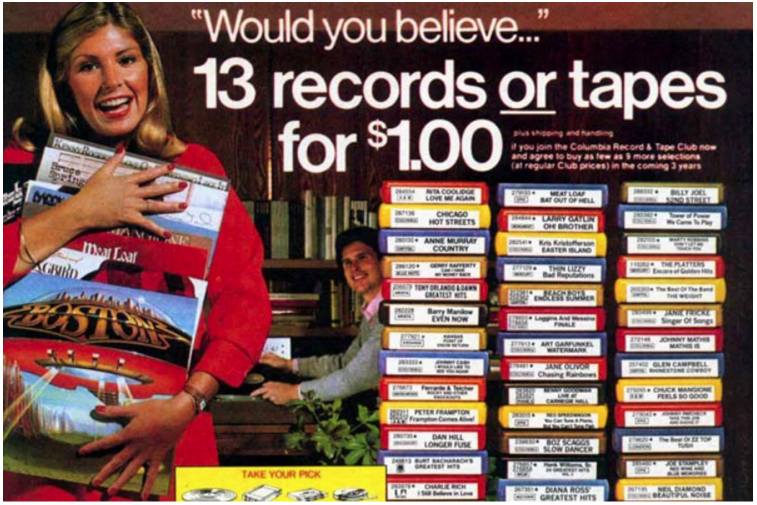 This offer from Columbia House is one of the best-known and most effective Tripwires ever created. Simply put, buyers paid a super small fee to get their first taste of a worthwhile product and then became full-blown customers as they rolled into the monthly subscription service. Today, you can use this same approach to fuel the conversion funnel for your travel products and services, allowing you to convert more bookings at a higher-margin. Let’s take a look at a more relevant example. Why is offering a Tripwire worth my effort? It’s just a fact that travelers almost never “just book” on the first site they find. You have to woo them, motivate them and hook them. How can I figure out my customer acquisition cost (CPA)? Calculate the total number of new customers acquired in the period the money was spent. Divide total expenses by the number of new customers. For example, if a company spent $2,000 on marketing in a year and acquired 100 customers in the same year, their CPA is $20.00. With a well-executed conversion funnel, you can cover these costs with your Tripwire, so every booking or add-on that comes afterwards becomes pure profit. Once you calculate your customer acquisition costs, you can build a tripwire packed with enough value that you can sell it at a price high enough to cover you CPA. You’ve done the hard work of attracting prospects into your marketing funnel with your Lead Magnet and turned them into paying customers with your Tripwire, now it’s time to get some real booking revenue into your business by offering your core product! Good news – you already have your Core Offer ready to go! Your Core Offer is your flagship product or service (the one most of your customers buy that also gives you great margins). There’s no need to create anything new. Most travel and hospitality providers stake their entire livelihoods on making cold offers of their core products to cold prospects with minimal results. We encourage you to reject that approach. With the addition of the Lead Magnet and Tripwire Offer, you should see your Core Offer sales grow exponentially! Entrepreneur and marketing expert Marcus Sheridan points out that “a successful marketing funnel depends on how well you establish and nurture relationships with your market.” Depending on the price point of your product/service, your customers may need more or less communication. This is why it’s critical to over-deliver value with the Lead Magnet and Tripwire. If you build out your conversion funnel using the Customer Value Optimization model, you’ll have a pipeline of QUALIFIED leads and Tripwire buyers (customers) – when done right, this should make it so that sales of your Core Offer will be profitable for you – even in a price competitive environment. But, your Core Offer doesn’t have to be the only way to gain profit. If you follow through on the CVO process, you could take some of what you make from the Core Offer and reinvest it to acquire more customers. Then use the next steps to truly create profit. The CVO model empowers you to spend more than your competitors to acquire a customer. Step 6 – Offer A Profit Maximizer and Step 7 – Establish A Return Path. 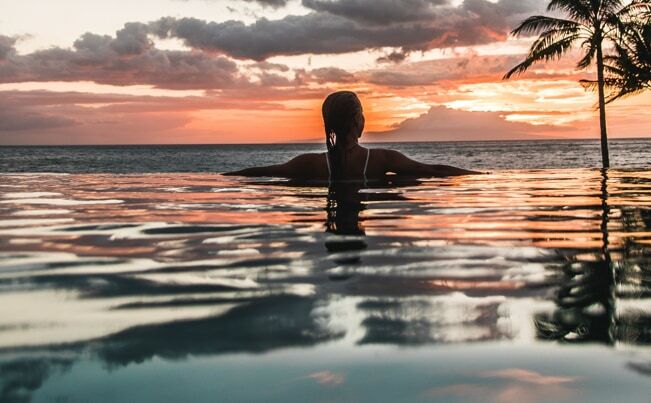 Dining packages, spa experiences, premium liquor, you name it – any offer made after the core product is a Profit Maximizer, and this is where smart travel companies can maximize their cash flow. The world’s most successful businesses — travel related or not — generate the bulk of their margins from Profit Maximizers. Express oil change companies like Jiffy Lube don’t see much net revenue from their core offer of oil changes. After the cost of supplies and employees, there isn’t a lot left over. The real money comes in with added services like tire rotations, air filter changes, and changing belts. McDonalds spends a fortune on advertising and burger sales probably cover the cost of customer acquisition, but not much else. It’s when customers buy fries and a soda that the franchise owner generates the real money. Best Buy makes little profit on high-cost items like TVs and computers which are expensive wholesale. But, the company maximizes profits through sales of accessories, warranties and technical support. What could you be offering as an upsell or cross-sell? What could you bundle with your Core Offer? How can you incorporate a subscription or membership into your business model? 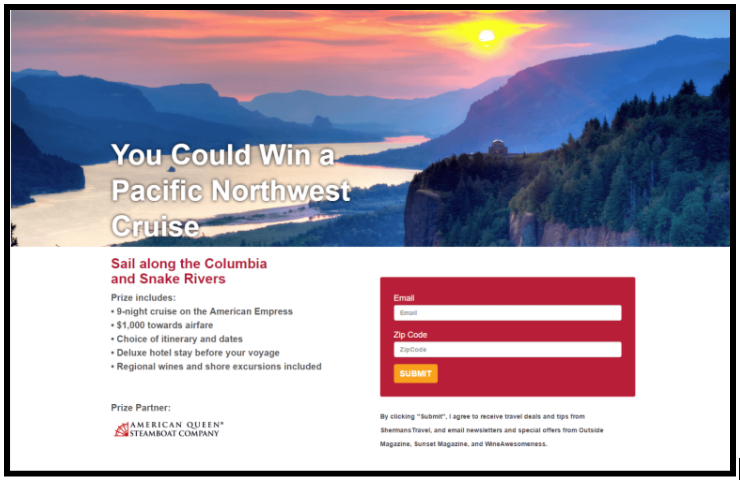 As a hotel, excursion operator, cruise line or travel business, remember to shape your Profit Maximizers to ensure that these upsell and cross-sell efforts are in tune with your core product, your brand and values. Doing this helps to ensure that guests keep coming back for your unique experiences. And that means more profit generated by your business. Tripwire and Core Offer purchases are not enough — not if you’re looking to maximize profits for your business. Establishing a Return Path is the step that turns an isolated transaction into multiple future transactions. The objective of the Return Path is frequent, strategic communication with your buyers and leads in an effort to get them to buy from you again and again. Develop a process, ideally automated, for sending out new content, new offers and informational updates about your company and your offerings products via email, phone, or mail. Likewise, you have permission to email your customers (past guests and TripWire purchasers) to offer them new Lead Magnets, that lead to new Tripwires, Core Offers, and Profit Maximizers increasing their frequency of purchases and, ultimately, the average Customer Lifetime Value in your business. At a minimum, you should build an autoresponder email series to cover every step in your funnel where a prospect could exit without taking the next offer. This “Email Follow-up Machine” will provide you with exciting new opportunities to extend value, drive additional bookings and upsell revenue-rich add-ons, producing compounding results that you will see in your bottom line. 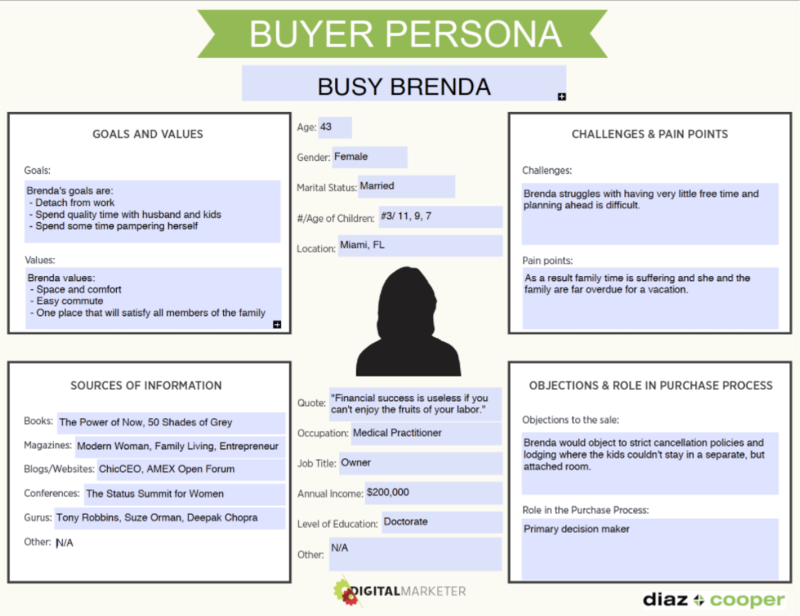 Define your ideal customer by creating a Buyer Persona. This helps you to craft message, offers, and content uniquely designed to create value on your customers’ terms. This is where you go to find and invite your Buyer Persona to come visit your website. Viable traffic sources include, but are not limited to: Facebook Ads, Google Ad, Blogs, SEO (Organic Search), etc. This is a free and valuable offer that your audience can get in exchange for giving you their contact information. It establishes trust with potential customers, gives them something of value before they buy, and gives you permission to follow-up with them they don’t buy on the first visit to your website. PRO TIP: To maximize effectiveness, include helpful resources that go beyond your product or service. 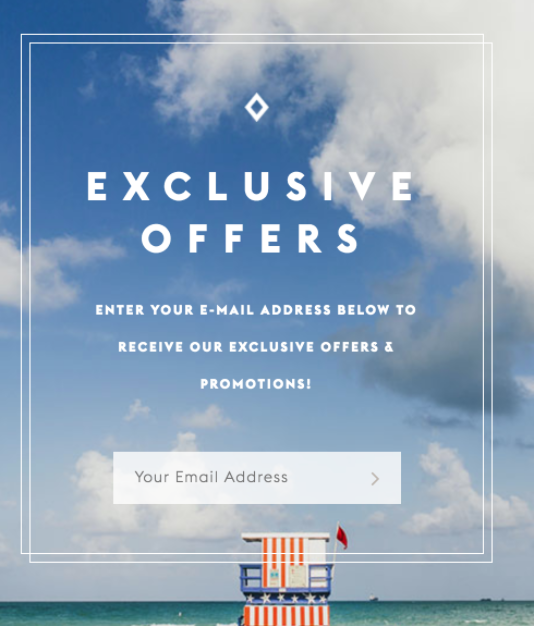 Creating a low-cost “entry-point offer” transforms a lead into a customer, warms them up to purchase your core offer and allows you to recoup some of the money you spent on promotions to get them there in the first place. This is an upsell that adds value to your Core Offer for your customer, as well as margin to the sale for you. There several different types of profit maximizers you can deploy – I’ll share more on that later in this article. Establish ongoing customer conversations and offers to bring your guests/customers back for more. Repeat buyers are not only more profitable than new buyers, but also these brand loyalists help you lower your cost of acquiring new customers by promoting your brand to others. Are you ready to see how you can make Customer Value Optimization work in your travel business? We worked with some folks to put together a comprehensive list of all the different tactics you can use to grow your business – Remember Attract More Customers, Increase Transaction Value, and Increase The Number Of Transactions? When we were finished, the list was 73 items long! We'd like to go over this list with you and figure out the ONE BIG THING you should be focusing on so you can get a fast start to putting the CVO model to work. Want Some Help Putting These Ideas To Work? Your digital marketing success centers around your website – is it selling hard enough for you? What steps in your Customer Value Journey need optimization? Fill out this form to request a FREE Consultation.